This project represented an extensive collaborative effort among the consultants and staf from several San Francisco agencies. Van Ness Avenue currently has two primary Muni bus routes and seven Golden Gate bus routes, with approximately 51 buses in each direction during the peak hour. 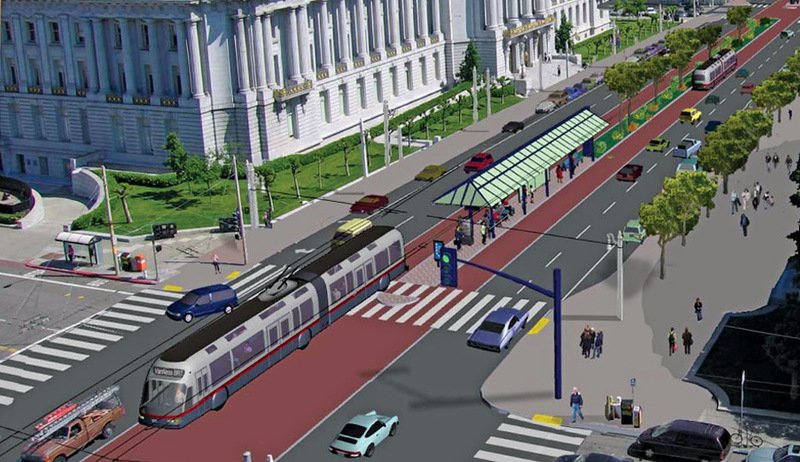 The project began in 2004 with a feasibility study for a bus rapid transit system along Van Ness Avenue, and continued in 2007 with preparation of a joint EIS/EIR. The project alternatives involved center running (center or side platforms) and side running bus lanes, all of which would include low floor buses, far side stops, and a signal priority system. Van Ness Avenue is also US-101, so the project requires extensive Caltrans review and approval. CHS Consulting Group has been involved in this project since its inception in 2004. For the Feasibility phase between 2004 and 2007, CHS was responsible for the identifcation of transit operations issues (travel time, delay, and schedule adherence) and opportunities, trafc analysis, and decisions on the number of left turn opportunities. For the Project EIS/ EIR phase since 2007, CHS was responsible for trafc, transit, and parking analyses. CHS worked closely with SFCTA staf on travel demand forecast and trafc diversion analysis. Sub- sequently, CHS prepared trafc analysis for 141 intersections along Van Ness Avenue and 5 parallel streets, for three BRT confgurations (no project, side running, and center running), and for two scenarios (2015 and 2035). VISSIM simulation analysis was used to estimate future transit travel time and speed. CHS also participated in and led presentations for many agency stakeholder meetings and public meetings. The SFCTA and SFMTA Boards certifed the Final EIR in September, 2013. CHS is presently assisting SFMTA in assessing trafc impacts during the construction period and performing technical review of signal designs along the corridor.